Sahara India Pariwar has made a $2-billion bid to buy the debt of struggling Hollywood studio Metro-Goldwyn-Mayer (MGM) Inc.
Agency reports said the new offer came a day after MGM said it had got another extension on an agreement to put off interest payments on about $4 billion in debt until October 29. The studio has rights to the James Bond franchise and owns half of the upcoming movies based on J R R Tolkien's The Hobbit. It is facing possible bankruptcy but has several suitors, including Spyglass Entertainment, Time Warner Inc and Lions Gate Entertainment Corp. The move by Sahara India Pariwar in making a bid for Hollywood studio Metro-Goldwyn-Mayer is not the first such attempt by an Indian company. Earlier in the year, the Anil Dhirubhai Ambani Group's Reliance Entertainment had reportedly attempted to buy the studio but the talks did not materialise. In the biggest proposed investment by an Indian company in Hollywood, Sahara is in discussion to buy the debt of MGM for around $2 billion (Rs 9,400 crore). It is understood to have talked to mediators for the deal. MGM has about $4 billion in debt. 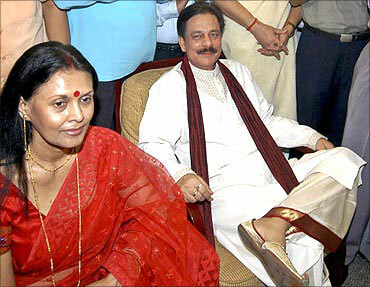 Image: Subroto Roy, chairman of Sahara India, with his wife Swapna Roy. "Mutual interest discussions are on but they are at a preliminary stage now and it is too early to comment on the issue," said a spokesperson of Sahara India Pariwar, which owns businesses in media, entertainment, real estate and insurance. If the deal fructifies, this would be one of the biggest overseas acquisitions by an Indian firm in the media and entertainment space. Sahara has diversified business interests that include financial services, housing finance, mutual funds, life insurance, city development, real estate activities, print and television media, film production, sports, information technology, health care, tourism, hospitality and consumer products. It recently bought a new Indian premier league team -- Sahara Pune Warriors -- and also sponsors the Indian cricket and hockey teams. MGM is an American media company, involved primarily in the production and distribution of films and television programmes. MGM was founded in 1924 when the entertainment entrepreneur Marcus Loew gained control of Metro Pictures, Goldwyn Pictures and Louis B Mayer Pictures. MGM made a series of acquisitions, including Metromedia's film subsidiaries and took huge debt in the process. It also attempted to take over Universal Studios, but failed and was forced to sell several of its cable channel investments. The debt load from these business deals negatively affected MGM's ability to survive as an independent motion picture studio. After a three-way bidding war, which also involved Time Warner, MGM was acquired in 2004 by a partnership led by Sony, Comcast, Texas Pacific and Providence. Facing possible bankruptcy, MGM has several suitors, including Spyglass Entertainment, Time Warner Inc and Lions Gate Entertainment Corp. Sahara's talks with MGM are at a time when Spyglass Entertainment has signed a non-binding letter of intent to take over the MGM management. 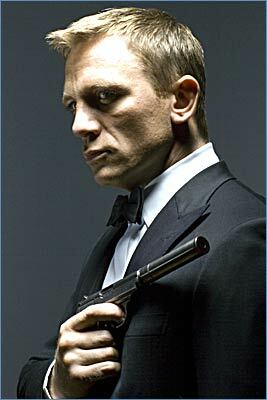 Image: Daniel Craig as James Bond. MGM has the rights to the James Bond franchise. The letter of intent from Spyglass founders Gary Barber and Roger Birnbaum was signed in the first week of this month. 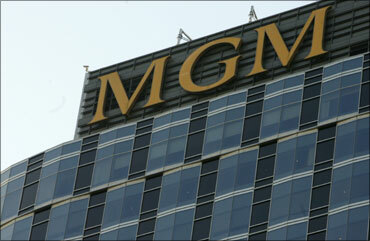 MGM's debt holders and board of directors are yet to approve the deal. According to The Hollywood Reporter, the tentative agreement with Spyglass values MGM at $1.9 billion. Meanwhile, activist-investor Carl Icahn, who is fighting for control of Lions Gate entertainment with his 33 per cent of stock, is said to be quietly buying up debt in MGM. Icahn had previously accumulated and then sold off debt in MGM earlier this year. In the past few weeks, he has already acquired a single-digit percentage in the studio's $4-billion debt. He has also picked up substantial debt in the Blockbuster Inc, the near-bankrupt home-video chain. According to the Los Angeles Times, Lions Gate Entertainment Corp has an alternative proposal on the table, to merge with MGM. Warner Brothers' parent, Time Warner Inc, is also in the queue, with a long-standing $1.5-billion acquisition offer. Prior to its interest in MGM, Reliance Entertainment had made its Hollywood debut in 2009 by agreeing to invest $825 million in DreamWorks. That includes an investment of $325 million by Anil Ambani to buy a 50 per cent stake in Steven Spielberg's DreamWorks. 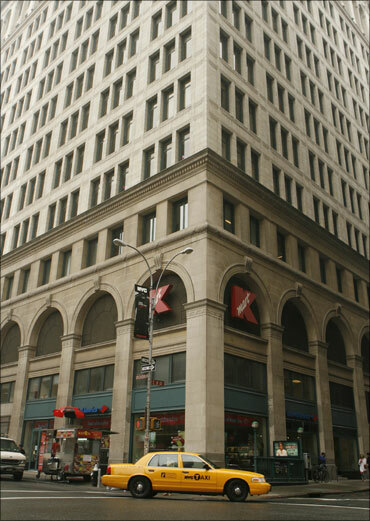 Image: The Time Warner AOL headquarters in New York.